Foscari family (Venice and Vienna, c. 1810). Guicciardi family, Milan, by 1858. The very foundation of the Christian faith is the belief in Jesus’s resurrection and victory over death. Here the 15th-century Flemish master Dieric Bouts communicates the miraculous nature of this event with great subtlety. Christ steps from the tomb, heading directly towards us. An angel alights beside him, garments still fluttering behind. The heavy marble lid has slid open to form the shape of a cross. 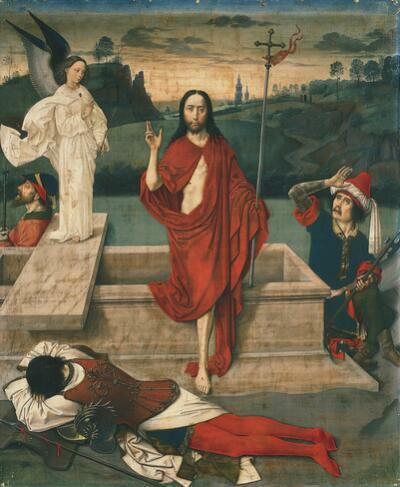 As Christ emerges, he appears to step on his cloak. But is his foot really touching the ground? Pale and ethereal, he seems almost weightless, yet he commands our full attention. His rigid upright form, in the dead center of the picture, holds the complex composition together, stilling the potential tumult of this miraculous moment. As Christ’s head rises above the line of the horizon, dawn breaks like a halo behind him. His gaze radiates spirituality. A placid, rolling landscape stretches into the distance…. The banner fluttering from the cross draws our attention to a trio of tiny figures on a hill—the three Mary’s descending the winding path to anoint Christ’s body. They will find only an empty tomb. Around Christ, the three guards are very much of this world. After a long night’s watch, two have fallen asleep. One stretches out on his armor in front… At the left, another is caught in mid-snore. But the soldier on the right starts back in awe at the miracle unfolding before him. This powerful work is painted on linen, making it lightweight and easy to transport. The medium is distemper, a mixture of glue and pigment thinly applied in translucent layers that show off Bouts’ incredible skill as a draughtsman. In spite of its fragility, the painting has survived remarkably well over the centuries. But at the top, you can make out a strip of blue once protected by a frame, showing how bright the original colors must have been.